There is one personality whose name is not referred to in the Srimad Bhagavatam, yet the readers of Srimad Bhagavatam nuture the hope of becoming that person's devoted servant. May that personality, who is everything to Bhagavan, completely destroy our false-ego and grant us shelter at Her feet. Today is Her appearance day. Having accrued all varieties of compassion from Bhagavan, she distributes that as gifts to all. May that personification of great mercy manifest within our hearts and make Her appearance there. May Her appearance day be the concern of our adoration. Generally we hear that the whole world is maintained by Govinda. Many people discuss about Govinda in this way. Yet there is one whom Govinda Himself considers as His sarvasva – His all in all. Without taking shelter of that personality, we will not be able to comprehend what sarvasva actually means. The word sva means ‘one’s own’, and sva also means ‘treasure.’ Sva means Govinda’s own and also one who is Govinda’s treasure. She is the complete wealth of Govinda – the wealth of the wealth of Govinda. She is Govinda’s sarvasva-vastu. When we make Her our worshippable object, then we will understand the actual meaning of worship. All the sastras loudly proclaim that those things in relation to Bhagavan are the objects of worship. Apart from Him, no one else can be worthy of the word aradhya (worship). At present we are bound by ignorance and we have forsaken our search, cheating ourselves out of attaining prema. At the time when anarthas arise, we mistake Him for something else. Our ultimate goal is artha (that which is necessary), the opposite of which is anartha. If we do not serve those innermost necessary ideals, or perfections that are available to us, and if we do not gain instructions on the matter of service, then we will be ruled by our own false-ego, rendering service unto something else other than that which is actually worthy of service. Only divine love for God is worthy of worship. Understanding this point clearly, we live with the fervent hope that we will eventually be counted amongst Her retinue. Otherwise, it is better for us to die thousands of times. This is the devotee’s only desirable hope – when will that ocean of nectarean hope bear fruit? I believe it is imperative that I maintain my life because of that hope. But because our eagerness does not increase, that hope is not completely attained – that hope is not fruitful. If that hope is not fulfilled today, if today Govinda’s sarvasva does not manifest in our hearts, then we have been deceived. You will not be able to find anyone more unfortunate than us in the history of the world. If we are cheated out of serving that personality whose mercy awards us everything we need, including residence in the Lord’s holy dhama, and all things connected to Him, and if we cannot understand Her identity or discover Her within the 18,000 verses of the Srimad Bhagavatam, then our study of the Srimad Bhagavatam has been pointless. Being intimately acquainted with Her identity, Sri Gaurasundara has spoken to us on the topic of unnata-ujjvala-rasa (the highest mellows of conjugal love) , explaining the various ways of serving the Lord and the process of pure service. It is only because He spoke to us about ujjvala-rasa that we may understand the topic, as well as the opposite – the meager splendor of material rasa. In order to incite us to render service unto Him, Bhagavan has personally given us knowledge of Himself in so many ways. However it is necessary that we fully understand that personality who has rendered such perfect service to Bhagavan that He has made Her the object of His own service. Those who praise Her can award us the qualification to serve Her and they can manifest anuraga (attachment) for Her lotus feet within our innermost heart. The intelligence and strength to serve Her is attained by accepting the association of Her beloved friends who are under Her shelter – in this way we may realize that service to Her is our highest objective. When we can understand, through the instructions of the mahajanas, that She is Bhagavan’s sarvasva, we must proceed to serve Her, knowing that the prosperity of worship only exists in Her. From this day forward, Her appearance day, if we engage in Her service then we shall become qualified to reach the pinnacle of the highest type of auspiciousness. All of us do not pray for that highest auspiciousness. But if by some ajnata-sukrti we obtain the association of one of the associates of Vrsabhanu-nandini, who is the personification and source of supreme auspiciousness, and if we are granted the actual good fortune of hearing genuine discussions about Her, then we can attain the inspiration to journey along the path of highest auspiciousness. The Lord explained all these topics to Brahma, the original person, but after some time the people of this world forgot the Lord’s words because the stream of their thoughts were subjected to the effects of old age and destruction. “As I speak, listen to Me and try to understand. Knowledge about Me is extremely confidential.” That knowledge is endowed with realization, it is knowledge possessed with confidentiality – it is the supreme secret. Rahasya means rahasi sthitah – this means that those secrets cannot be assimilated by any external force, nor can any branch of those secrets be grasped. Due to the currents of thought that exist in the external world, we have forgotten the essential objective of taking shelter at the feet of those who have true knowledge of the atma. Bhagavan is ever ready to bestow this knowledge. Bhagavan told Brahma: “As I speak, listen to Me and try to understand. Without My mercy no one is eligible to hear or assimilate this message. Only through My mercy can anyone obtain this confidential knowledge. What am I? What is My form? What is My svarupa? What are My qualities? What are the distinctive characteristics of My confidantes? What is My lila? My supramundane pastimes that are surcharged with rasa far exceed the path of mundane sentiments. There is no way to attain this without the potency of My mercy. I am the storehouse of all transcendental qualities – I am not speaking about those qualities that are contaminated with the modes of passion and ignorance, but of those that are the foundation for creating, maintaining and destroying the universe. I am distinguished by these attributes and I am the active cause of all effects, thus I am the essential original principle. This can only be realised by attaining My mercy.” In this way the words mad-anugraha (My mercy) have been used. Information concerning Bhagavan’s parts and parcels, information on confidential topics related to Him, information concerning realized knowledge – specifically that which is endowed with spiritual consciousness, and information concerning His opulence – these are all supremely confidential and non-dualistic. It can never be initiated at any period or for any reason without the express mercy of the Lord. This secret knowledge is thoroughly expressed in the beginning of the catuh-sloki verses of the Srimad Bhagavatam. We are most fortunate that Sri Gaurasundara has revealed this to the world. A secret topic has been mentioned, but the name of that personality about whom this secret is concerned has not been uttered. Because it is a secret, it should not be revealed to those advocating foolish ideologies and thus it has not been openly disclosed. After hearing the pastimes of Nanda-nandana as narrated in the Bhagavata, such people do not gain strong faith, and rejecting all these topics they simply deliberate upon the impersonal non-dual nature of the Lord, which is favorable to their mundane realisations. Some of them consider it reasonable to merge into that. Without hearing from a proper source, their perceptions will be perverted. Due to their vehement hatred of service to the Lord, such persons can never understand topics concerning the intrinsic nature of bhakti. Due to the trajectory of the sun, the appearance day of the Supreme Goddess who is fully imbued with rasa, has arisen in our own radiantly pure hearts. The roaming sun is revealing that Supreme Goddess. Therefore, today the demigods are also showing us great favour by revealing this secret. "The hope of the devotees is that they may serve the lotus feet of Srimati Radharani. This is also Manohara Dasa’s desire." Srimad Gopinatha nurtures the mellows that manifests during the rasa-lila. Standing at the shore near Vamsi-vata, He attracts all the gopis by the sound of His flute. May He grant us all auspiciousness. We will never assent to enjoying Sri Krsna (sambhoga) without taking shelter of She who is His all in all. To shed light on this, the author of the asta-padi reveals something that supplements the description in the Bhagavata when he says, tatyaja-vraja-sundarih – as all the gopis danced in the rasa-lila, Krsna abandoned them in order to find Sri Radhika who resided in His heart. The fetters of the love of all the other gopis are powerless, weak and susceptible in comparison to the bonds of Varsabhanavi which are extremely strong and powerful. All the gopis took shelter of Vrsabhanu-nandini’s adhirudha-mahabhava – overwhelmed by mohana, madana and other intense feelings of separation, they went to find Krsna. They all understood that without taking shelter at the lotus feet of Varsabhanavi, Govinda’s sarvasva, madhura-rasa is never completely nourished. All the loving sentiments with which the various gopis perform their services, simultaneously exist in Varsabhanavi exclusively in their entirety. Deserting all the other gopis, who were immersed in feelings of prositabharttrka etc. Krsna was attracted by Varsabhanavi’s captivating charms, since She possesses all these loving sentiments in full. Thus He set out to find that personality who even attracts the all-attractive One. The gopis are expansions of Radhika and are eternally a portion of She who is the original source – they could not bind Krsna, for He completely belonged to Radhika. Thus She enticed Krsna, who attracts everyone, from the rasa-sthali. One can only understand such topics if the functions of the soul have awakened to the taste of madhura-rati (divine love). But those whose hearts contain an intense mood of vatsalya-rasa can also completely appreciate the sweetness and beauty of such pastimes. Sri Radhika is the abode of Sri Krsna’s intense love, and amongst all other dear associates, She is the most illustrious and the most beloved in all respects. Uddhava and other great devotees pray for the dust of the feet of the gopis, and all the gopis consider themselves most fortunate if they obtain Her shelter. The topmost devotees, who are drawn towards madhura-rasa and who have reached the topmost levels of devotion to Bhagavan, take refuge in the land of Varsabhanavi’s pleasure pastimes and bathe in Her lake, Radha-kunda. With a sentient attitude they constantly bathe and reside there. Those who have loyalty towards Saibya and Candra do not even have the qualification to drink there. To constantly reside on the banks of that lake and to bathe there with a mindful attitude is not achieved by any common, fortunate person. So long as the divinity of Varsabhanavi’s youth and nature does not become the subject of our reflection, we will never fully comprehend the glories of achieving Her shelter. In order to perform bhajana, it is essential for the students of the Bhagavata to know Her Name. Bhajana begins with nama. One cannot begin bhajana starting with lila. prathamam namnah sravanam-antah-karana-suddhyartham-apeksyam. Suddhye cantah-karane rupa-sravanena tad-udaya-yogyata bhavati. 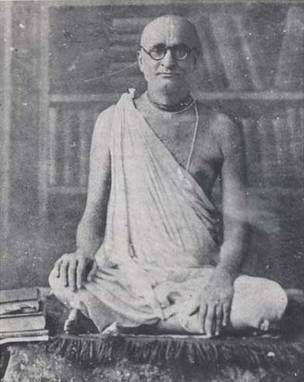 Samyag-udite ca rupe gunanam sphuranam sampadyate sampanne ca gunanam sphurane parikara-vaisistyena tad-vaisistyam sampadyate. Tatas tesu nama-rupa-guna-parikaresu samyak sphuritesu lilanam sphuranam susthu bhavatity-abhipretya sadhana-kramo likhitah. Therefore, if our contemplation on rasa is not born from an attraction to the Holy Name, then we are not qualified to study Bhagavan’s form, qualities and pastimes. Some may have attained external, mundane perfection in grammar, however, as long as their conduct conflicts with that of realized souls, the topic of the Lord’s rasa-lila will never be grasped by them. For this reason, Sri Gaurasundara has explained nama-bhajana. Along with the taraka-brahma-nama (the Divine Name that grants deliverance) we find the word ‘hare’ and if one does not understand the primary meaning (vidvad-rudhi) of this word, there will be difficulty. Even when we consider the word ‘rama,’ many times we are compelled by historical concerns. Repeatedly, allegorical and metaphysical theories, as well as the fictitious notion of imposing human nature upon the Supreme Lord ruin our pure intelligence. Those who lack rahasya-jnana (knowledge of confidential truths) and try to be an intermediary for darsana of Radha-Govinda, will finds that knowledge concealed from them. In the maha-mantra, the word ‘Hara’ which denotes Varsabhanavi, becomes the word ‘Hare’ in sambodhanatmaka-pada (the vocative case). In the maha-mantra, the word ‘Rama’ refers to Radhika-ramana Rama in the vocative case. Those who have not achieved the qualification to enter into madhura-rati and have not obtained rahasya-jnana consider that ‘Hare’ is simply the vocative form of Hari. Some even say that the word ‘rama’ means atma-rama (one who is self-satisfied) and go no further than that. To declare that Purusottama alone exists is to present only half of His true identity. Those words that do not express the other half only mislead us. When we are cheated of the conception of a Supreme Divine Couple, we will also reject the idea of the non-difference between saktimana and sakti (the Potent and the Potency) – then, whatever small understanding we may already have of Purusottama also degrades, and results in the theory of an impotent God. The conception of Radha-Govinda is the most complete. Discussions on anugatya-dharma towards Purusottama who exists alone can only terminate in vatsalya, sakhya and dasya-rasa – the topic of unnata-ujjvala-rasa is not discussed. Direct words such as Radhanatha, Radha-ramana etc. describe His totality and completeness; words such as Brahman or Paramatma can never establish this. All those who traverse through the kingdom of sadhana-bhakti, and then the realm of bhava-bhakti in search of prema-bhakti must realise that the topmost pinnacle of prema-bhakti is only found in the divine love of Varsabhanavi and nowhere else. Without Her shelter, the jiva achieves very little eligibility.